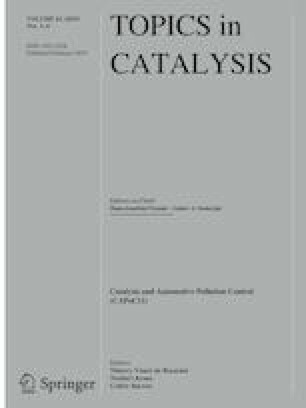 Nickel-based catalysts supported on sepiolite catalysts, with a nickel loading between 1 and 10 wt%, have been synthesized by several synthetic strategies (precipitation-deposition, impregnation and grafting-complexation) and subsequent calcination and reduction. The catalysts were characterized by H2 thermoprogrammed reduction (H2-TPR), X-ray diffraction, transmission electron microscopy, N2 adsorption–desorption at − 196 °C, NH3 thermoprogrammed desorption (NH3-TPD) and CO chemisorption. FUR hydrogenation in gas-phase revealed that the most active catalyst was the catalyst synthesized by the grafting-complexation method due to its highest metallic surface area and smallest metal crystal size, reaching a FUR yield close to 85% after 5 h of time-on-stream (TOS) at 190 °C, using a H2:FUR molar ratio of 11.5 and a WHSV of 1.5 h−1. Furan (F), methylfuran (MF) and furfuryl alcohol (FOL); however, the selectivity towards F and MF tend to decrease with the TOS, while FOL selectivity increases. The authors are grateful to financial support from the Spanish Ministry of Economy and Competitiveness (CTQ2015-64226-C03-03-R project), Junta de Andalucía (RNM-1565) and FEDER funds.